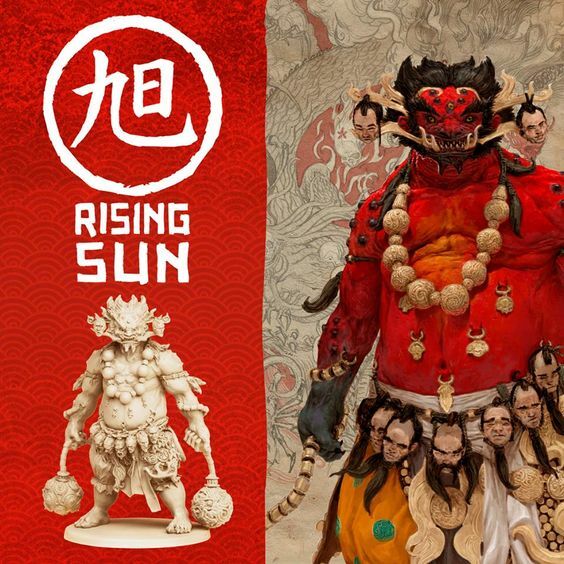 Rising Sun is a new board game that is currently blowing up on Kickstarter. The game is set in the dynamic period of Feudal Japan mixing fantasy creatures with Samurai and Ninjas. Multiple Toylab Bloggers have jumped on to the Kickstarter and so you can expect to get a lot of news and reviews of the game right HERE! This post is to bring together all of our coverage of this epic game so fans of it can find news, reviews, battle reports, tactics, explanations quickly. Rising Sun is a board game for 3 to 5 players set in legendary feudal Japan. As the Kami descend from the heavens to reshape the land in their image, it is up to each player to lead their clan to victory. Use politics to further your cause, negotiate to seek the most profitable alliances, worship the Kami to gain their favor, recruit monsters out of legend to bolster your forces, and use your resources wisely to be victorious in battle. What is Rising Sun? the hottest game on Kickstarter ever? Who are the Oni in Rising Sun?